Note: These remarks were delivered at the Wayne State University Labor Studies Center gathering entitled: “The Building Bridges Conference—Connecting Our Struggles and Identifying Strategies to Build Strength and Solidarity.” The event was held at the Westin Hotel in Southfield, Michigan right outside the city of Detroit. This panel is designed to emphasize the need to reflect on the history of various efforts aimed at changing the social conditions under which we have lived for an extended period of time. Since we are five decades away from the groundbreaking year of 1968 I would like to briefly review some important developments which took place just in the first six months of that time and their relationship to what is happening today in 2018. The focus of my presentation will be related to ongoing problems of imperialist war, the necessity of bringing dignity to all forms of labor, state repression and the movement of the working class to advance its interests within a country and world still dominated by the capitalist mode production. Since we are speaking from the city of Detroit our experience here portends much for the United States as a whole and indeed the international community in general. Prior to February 1968, the then administration of President Lyndon B. Johnson was telling the people in America that victory was in sight in the years-long war in Vietnam. However, this changed significantly after the second of the month when the Tet Offensive was launched by the military forces of the National Liberation Front (NLF). Attacks were carried out in numerous cities and villages throughout South Vietnam including the capital of Saigon. The U.S. embassy became a terrain of battle between Pentagon units and the guerrilla resistance. By the conclusion of the following month, President Johnson had announced that he would not pursue a second term as head-of-state. Just five days later, the Civil Rights and Antiwar leader Dr. Martin Luther King, Jr. was assassinated in Memphis. Within the interim weeks of early February and April 4, 1968, the historic Memphis Sanitation Workers’ strike erupted. This labor manifestation represented a clear break with the past subservience of African American working class people and the white ruling class in the South. These 1,300 men were demanding recognition as a labor union along with better salaries and working conditions. This strike of course was the outcome of mounting frustration with the system of racial capitalism in the South which had profound implications for the entire country. However, it would take a tragic incident to spark the work stoppage. Two African American workers, Echol Cole and Robert Walker, were crushed to death in a malfunctioning garbage truck on February 1. Angered by the response of the Memphis city administration led by then Mayor Henry Loeb, by February 11 the workers held a meeting to call for a strike. T.O. Jones, who had worked for the Memphis Public Works was the leader of Local 1733 of the American Federation of State, County and Municipal Employees (AFSCME). Although the union had been awarded a charter to organize several years before, they had failed to gain improvements in the situation under which they toiled. As the strike continued the intransigence of the Loeb administration accelerated. On February 23 after Loeb had overrode a decision by the City Council to recognize the AFSCME 1733 and its demands, police were called out to attack the sanitation workers and their supporters in downtown Memphis. In the wake of this provocation the African American community in the city was galvanized forming a strike support committee called Community on the Move for Equality (COME). This group chaired by veteran Civil Rights activist James Lawson brought together people from the clergy, students and community people. 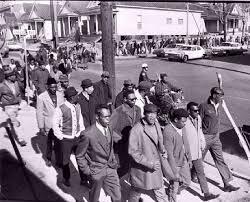 By March 18, Dr. King came into to Memphis to address a community rally of 6,000 people in support of the strike. Conditions were so dire for the sanitation workers that despite their often overtime working hours many of them still qualified for welfare payments and food stamps. The city refused to pay for extended work hours and the safety hazards were such, as mentioned earlier, that two men had been killed by faulty equipment which the city refused to replace. Dr. King and the Southern Christian Leadership Conference (SCLC) in conjunction with the Student Nonviolent Coordinating Committee (SNCC) had come out in opposition to the U.S. occupation and genocidal war in Vietnam. Urban rebellions had rocked over 200 cities since 1964 with Detroit being the largest in July 1967. Therefore, a convergence of antiwar protests, resistance to the draft, an increasing intolerance of institutional racism and the imperatives of reducing and eliminating poverty, set the stage for a protracted fight against the Johnson administration. Dr. King had been alienated from the president since taking a position demanding an immediate ceasefire and withdrawal from Vietnam. Concurrently in the late months of 1967 and early 1968, SCLC had announced it was mobilizing thousands of people to erect a tent city in Washington, D.C. demanding swift legislative action from the U.S. Congress to end poverty. The demands of the Poor Peoples Campaign of 1968 are still relevant today: full employment at living wages, national health insurance, a guaranteed annual income and the rebuilding of the inner cities. 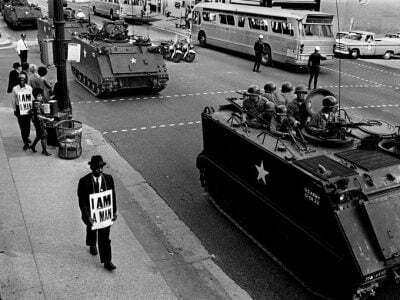 Such militant action in all likelihood contributed to the atmosphere that led to the assassination of Dr. King. In days and weeks following his martyrdom, rebellions erupted in approximately 125 cities across the country. The PPC continued even in the aftermath of Dr. King’s death. Thousands traveled to the nation’s capital where they remained for several weeks. Nonetheless, the repressive arm of the state would eventually force the tent city to be dismantled by the City of Washington, D.C. Although the PPC was crushed, the legacy of this monumental effort resonates some five decades later. There is still much to be said for the overall conditions of working class people and the poor in the present period. A nationwide movement supported by labor has resurfaced to demand significant increases in the minimum wage and union representation. The PPC is once again in operation targeting state capitals in more than two dozen states beginning in May. Threats of imperialist war and its implications remain with the ongoing occupations by the Pentagon and NATO in Afghanistan, the presence of troops in Iraq and Syria, pledges by the administration of President Donald Trump to destroy the Democratic People’s Republic of Korea (DPRK), the expansion of the U.S. Africa Command (AFRICOM) across the continent, plans to stage a Washington-backed military coup against the sovereign South American state of Venezuela, among other provocations. As working people we are funding a war machine which has hundreds of bases and other fields of endeavor throughout the world. These resources could be utilized to rebuild the cities, suburbs and the rural areas. Instead of bailing out the banks, the people are in need of pay raises, societal restructuring and reconstruction. Consequently, there is much work for us to do in the current epoch. The concepts of social unionism are as important in 2018 as they were in the 1930 during the height of the Great Depression. Let us take up this challenge and reshape the narrative from one of championing the rich to the crafting of a modern day New Deal for the 21st century. This is our task for the coming weeks and months.